Claudia McParland in Whitchurch-Stouffville Ontario Aug 9, 2017 Highly recommend this company for any issues you have. I was given a price range, which was very fair, and the final price was at the lower end of the range. They were efficient, clean, prompt and professional. I would recommend them to anyone and would use again (but hopefully won't need to!) """""""""""""""""""""""""""""""""""""""""""'Response AquaBlue Foundation Epoxy Crack Repair Specialists – Aug 9, 2017 – Hello Claudia M. in Whitchurch-Stouffville Ontario for your time to do a review.Yes thanks for your business and trust in allowing us to fix your foundation wall crack by epoxy injection in your Whitchurch-Stouffville new family home. Krista P. Collins in Oshawa Ontario Durham Region Review posted on Jun 7, 2017 Fast, knowledgeable, courteous service. 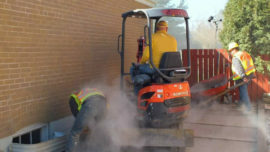 Cleaned site each day and was the only contractor that provided a solution that was preventative as well as restorative. Highly recommend this company for your water damage and foundation issues. The consultation is expensive, but you get what you pay for, and it was fully refundable once they were selected. """""""""""""""""""""""""""""""""""""""""""""""""" AquaBlue Foundation Epoxy Crack Repair Specialists – Jun 7, 2017 – Thanks Krista in Durham Region for your business Brick Sealing ,Inside Basement Weeping Tile Drain System,Exterior French Drain System, please if you should ever require our services again be sure to remind us of your time here providing a review.Thanks from all of us @ "The AquaBlue Oshawa Team"
Installed Sump Pump Basin ,Sump Pump and under floor drain in Oshawa Ontario HI, sorry for the delay. I wanted to wait a while to clean up and see how everything was working during the next rain. All is well, the pump is doing it's job and the area is nice and dry. Thank you! I've left a review on the two sites you mentioned, copy attached below. Thanks again to all of you for the great service. - ed During the heavy rains in May 2017, I discovered a severe leak & flooding in my basement. While I was tending to the flooding, I did lots of research on waterproofing companies and decided on AquaBlue. Their online job request form was straightforward, and despite the extremely busy time, they were out the next day to start repairs. They did come out right away to do an on-site assessment of my problem. This is a paid service, but understand that the fee comes off the total if they do the job. This consultation was very thorough: Pierre walked me around my house, pointing out possible issues of concern (tuck-pointing, gaps, etc.) and gave very helpful tips. Then in-house, he thoroughly explained the sources of my leak (saturated water table under the house) and what they planned to do to repair it. The next day, Pierre & his team were out, on time and got to work right away to break open the floor, and install a pump as a temporary measure until the ground was suitable to work on. The showed me every step of the way what they were doing and why, which was very helpful. The repair was completed the next weekend (due to excessive water buildup under the house). Again, they showed up promptly, performed an excellent installation of a new sump-pump system and kept me in the loop as they worked. Parts & labour are first-rate, and the cement patch work was perfect. Now that time has passed and we have had another very heavy rain, the previously problem area is bone-dry, and the sump-pump is functioning perfectly, evacuating water from the several inlets the AquaBlue team installed. I would enthusiastically recommend AquaBlue Basement Waterproofing Contractors Oshawa. Their pricing is competitive, and the work & skill is first-rate. They may be a little more expensive than competitors, but you get what you pay for, and the AquaBlue Basement Waterproofing Contractors Oshawa reputation and the names who trust them (Holmes on Holmes, etc.) speak for themselves. I love my house, and it deserves the best. Many thanks to Pierre, Natasha and the whole team for their great service and the peace of mind that it's provided. Brian S Rating 5/5 Review posted on Feb 23, 2017 Leaking water into our rec room for years. AquaBlue came in, dug up side of house, fixed weeping tiles, sealed side and no more water. Great job. """""""""""""""""""""""""""""" AquaBlue Basement Waterproofing Contractors – Feb 23, 2017 – edit – delete Thanks Brian S. in Oshawa Ontario for your business back in 2008 for excavating right side of house and waterproofing from outside 4o year old cinder block foundation. Also thanks for your review here from all of us @ AquaBlue Basement Waterproofing Contractors Oshawa serving most of Southern Ontario.We also appreciate your ongoing confidence in additional work contracted to us in Feb 2017 related to inside weepingtile drain systems being installed and cold cellar venting being installed below grade.